The Advantages of Lifting Magnets Over Other Hoisting Options | IPES International, Inc.
Do you own or operate a manufacturing plant that deals with a lot of heavy ferrous metals on a regular basis? You have a lot of hoisting options that you can use to pick these metals up. But your best bet might be to invest in lifting magnets that are capable of picking up metals that weigh anywhere from 500 to 3,000 pounds. Check out some of the advantages of using lifting magnets over other hoisting options below. Straps don’t need to be used to pick up metals with lifting magnets. When using other hoisting options to pick up heavy metals, you need to place straps around the metal first. Often, this means you’ll need to find a way to lift the metal up so that the straps can be placed around it. This can require extensive manpower and, in some cases when metals weigh thousands of pounds, it can prove to be impossible. Lifting magnets won’t require any straps at all. Just lower the magnet over the metal and turn it on, and it’ll pick it up without a problem. No damage will be done to metals when they’re picked up with lifting magnets. When you place straps around metal prior to picking it up, you always run the risk of doing damage to it. You may need to go back later and repair the damage or live with the damage that has been done. There is little to no risk of damage being done to metals when you use lifting magnets. The magnets won’t leave behind any scratches or holes in metal. Using lifting magnets can save you a lot of time and, by extension, money. Lifting magnets are so easy to use. They’ll save your manufacturing plant a ton of time and reduce the amount of money you must spend maneuvering metal around in your facility. You also won’t have to worry about your employees injuring themselves when using lifting magnets and missing out on work in the future. Lifting magnets are incredibly useful tools for those who work in many different industries. Allow IPES International to tell you more about the benefits you’ll get when you begin using them. 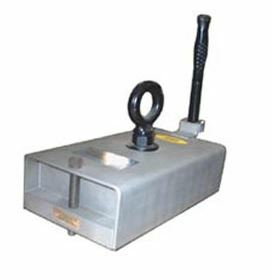 Call us at 412-781-4660 today to hear about our lifting magnets.